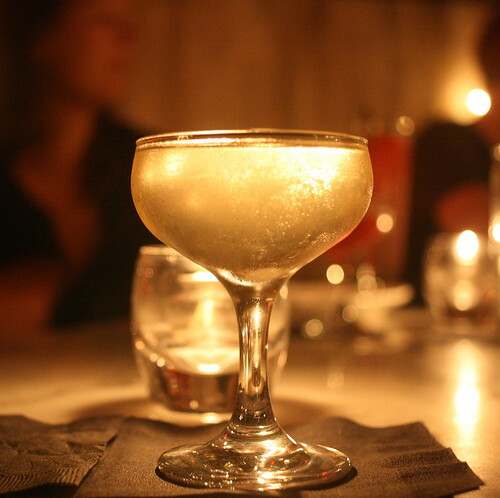 As I mentioned below, a few of us visited Death & Co. recently for a couple rounds, and while the "Electric Kool-Aid Acid Test" fit nicely into the post on sloe gin, the other drinks we had deserve a little showcasing of their own. Damon, who coincidentally took care of us on our first visit, was behind the stick again, and proceeded to wow us yet again. 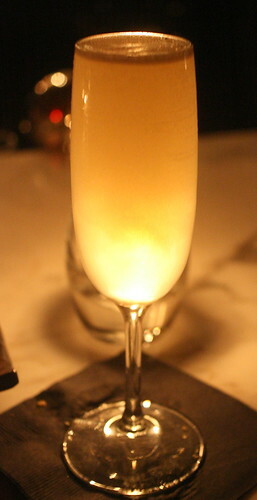 My second drink was the Miss Behavin': Champagne, Clear Creek Pear Brandy (this stuff is good), Laird's applejack, and fresh lemon juice. A nice summer drink, but maybe a little sweet for my taste. (Perhaps some bitters, or a little less applejack, or some regular brandy mixed with the pear brandy?) It went down fast, though, and I can see how this drink'd be a crowd-pleaser. And Patty rounded it out with a Maple Julep. I'd never had a good mint julep before -- the few times I've ordered them before, I've gotten what tasted like drinking lighter fluid through a roll of Certs -- but oh, what a difference good whiskey, fresh mint, and good technique can make. 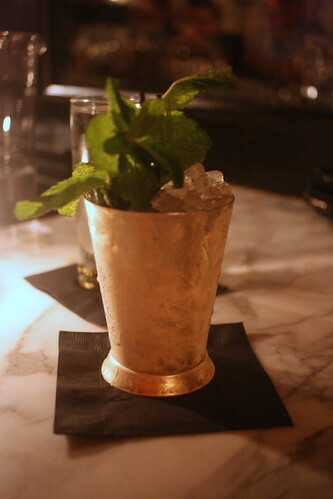 This was Rittenhouse Rye, maple syrup, and a whole lot of fresh mint over crushed ice in a silver julep cup, and was straight-out delectable. "It's a bit active", as Chico observed. And the spiciness of the rye and the deep flavor of the maple syrup (tasted like Grade B) were an inspired pairing. So....when can I go back? Wow. 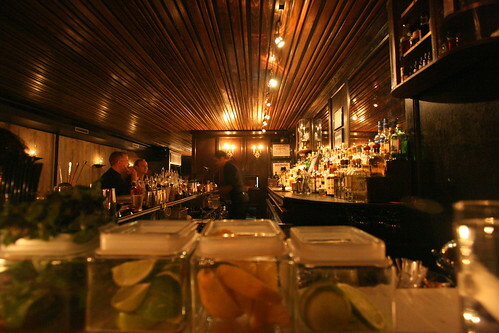 Not only do the drinks sound amazing, that bar is gorgeous. I could definitely live there. This post is making me wish I was back in New York! 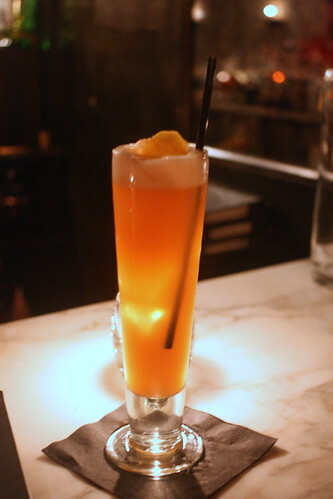 Death & Co. was one of my favourite bars, along with Clover Club and Pegu Club (I honestly couldn't pick a favourite between the three). Great drinks, great surroundings, great staff. I'm already planning my next NY trip, and can't wait to visit again. Fantastic photos by the way! 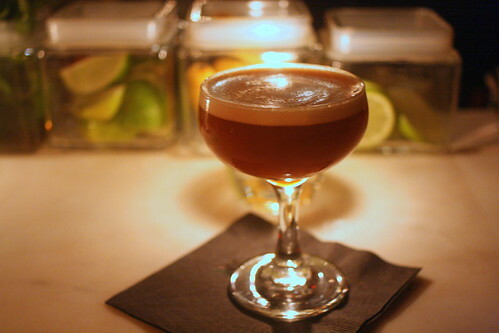 Those drinks look amazing, our NY writer Chloe listed Death & Co in her top 5 favourite cocktail spots. Definitely worth checking out when next in NY. Great pics. The Palermo Gentleman is one of my favorites. Great stuff my mouth is watering!